This thread is an ongoing project to document all of Microsoft Office Outlook's properties and methods as a reference for future Ahk scripters. I wanted to learn more about COM in general and more specifically for Outlook. I figure the best way would be to read through the entire MSDN and code some examples so that I feel I truly understand how it works. Any comments, examples, or flaws in this page please post below. Any examples given I will make sure to give credit to the author. ~Represents the entire Outlook application. ~You can use CreateItem directly from this object without traversing the entire hierarchy. ~Returns the topmost Explorer object on the desktop. ~Returns nothing if no explorer is active. ~Returns the topmost Inspector object on the desktop. ~Returns nothing if no inspector is active. ~Returns the topmost Microsoft Outlook window which can be either an Explorer or Inspector object. ~Returns nothing if no explorer or inspector is open. ~Use the Save Method to retain the search filter. - Scope (Required): The folder path. - Filter (Optional): The DASL filter that defines the parameters or the search. - SearchSubFolders (Optional): also search sub folders. - Tag: The name of the search for saving purposes. - FilePath (Required): The path of the file to copy. - DestFolderPath (Required): Path of the location to copy to. - ItemType (Required): The OlItemTypetype for the new item. ~This method can only create default items. MailItem.HTMLBody := "<HTML><H2>The body of this message will appear in HTML.</H2><BODY> Please enter the message text here. </BODY></HTML>"
- TemplatePath (Required): The path and file name of the template. - InFolder (Optional): The folder where the item will go. If empty will go to the default folder. ~Creates an Automation object of the specified class. - ObjectName (Required): The name of the object class to create. ~Returns the NameSpace object of a certain type. - Type (Required): "MAPI" is the only type supported. ~Creates a strong or weak object reference for a specified Outlook object. - Item (Required): The object to reference. - ReferenceType(Required): The object's type. ~Returns true or false indicating if a search will be synchronous or asynchronous. ~True if synchronous and false otherwise. - LookInFolders (Required): The path to the folders to search. Enclose the path with single quotes. ~Logs you completely out of Outlook. ~Returns an Application object that represents the parent Outlook application. ~Returns an Assistance object used to invoke help. ~Returns an constant indicating the object's class. ~Returns a COMAddIns collection that represents all the Component Object Model (COM) add-ins currently loaded in Microsoft Outlook. MsgBox % "There are " . ComObjActive("Outlook.Application").COMAddIns.Count . " COM add ins." ~Returns the default profile name. MsgBox % "The default profile name is """ . ComObjActive("Outlook.Application").DefaultProfileName . """." ~Returns a Explorers collection of all open Explorer objects. MsgBox % "There are " . ComObjActive("Outlook.Application").Explorers.Count . " explorers in the collection." ~Returns a Inspectors collection of all open InspectorObjects. Message .= Application.Inspectors.Item(A_Index).Caption . "`n"
~Returns True or False to indicate if an add-in or external caller is considered trusted. ~Returns a LanguageSettingsobject for the application that contains the language-specific attributes of Outlook. ~Returns the display name for the object. MsgBox % "The display name is " . ComObjActive("Outlook.Application").Name . "." ~Returns the parent Object of the specified object. ~Returns a String specifying the Microsoft Outlook globally unique identifier (GUID). ~Returns a Reminders collection that represents all current reminders. ~Returns the NameSpaceobject for the current session. ~The GetNamespacemethod can be used to accomplish the same thing. Only MAPI is supported. ~Returns a TimeZonescollection that represents the set of time zones supported by Outlook. Message .= TimeZone.Name . "`n"
~Returns or sets a String indicating the number of the version. ~A set of Store objects representing all the stores available in the current profile. ~Returns a Store object that is specified by Index. ~Returns an Application object that represents the parent Outlook application for the object. ~Returns an OlObjectClass constant indicating the object's class. ~Returns a Long indicating the count of objects in the specified collection. ~Returns the parent Object of the specified object which is the NameSpace object. ~Returns the NameSpace object for the current session. ~Occurs when a Store is about to be removed from the current session either programmatically or through user action. - Store(Required): The Store object to be removed from the current session. - Cancel(Required): True to cancel the removal of the specified store, False otherwise. ~Occurs when a Store has been added to the current session either programmatically or through user action. - Store(Required): The Store to be added to the current session. ~A Store can be added by using the Session.AddStore method. ~Represents a file on the local computer or a network drive that stores e-mail messages and other items for an account in the current profile. ~Returns a Folder object representing the root-level folder of the Store. ~The Parent propery returns "MAPI". Message .= Folders.Item(A_Index).Name . "`n"
~Returns a Rules collection object that contains the Rule objects defined for the current session. Message .= Rules.Item(A_Index).Name . "`n"
~Returns a Folders collection object that represents the search folders defined for the Store object. ~Returns a Folder object for a special folder specified by FolderType in a given store. - FolderType(Required): A constant in the OlSpecialFolders enumeration that specifies the type of the special folder in the store. Message .= Stores.Item(A_Index).Class . "`n"
~Returns a String representing the display name of the Store object. Message .= Stores.Item(A_Index).DisplayName . "`n"
~Returns a constant in the OlExchangeStoreType enumeration that indicates the type of an Exchange store. Message .= Stores.Item(A_Index).ExchangeStoreType . "`n"
~Returns a String representing the full file path for a Personal Folders File (.pst) or an Offline Folder File (.ost) store. Message .= Stores.Item(A_Index).FilePath . "`n"
~Returns true or false which indicates if the Store is a cached Exchange store. ~Returns true if it is a olExchangePrimaryMailbox otherwise it returns false. Message .= Stores.Item(A_Index).IsCachedExchange . "`n"
~Returns true or false which indicates if the Store is a store for an Outlook data file, which is either a Personal Folders File (.pst) or an Offline Folder File (.ost). ~IsDataFileStore supports only Exchange stores, and will return False for HTTP-type stores such as Hotmail and MSN, and for IMAP stores. Message .= Stores.Item(A_Index).IsDataFileStore . "`n"
~Returns true or false which indicates whether Instant Search is enabled and operational on a store. Message .= Stores.Item(A_Index).IsInstantSearchEnabled . "`n"
~Returns true or false which indicates if the Store is open. Message .= Stores.Item(A_Index).IsOpen . "`n"
~Returns a PropertyAccessor object that supports creating, getting, setting, and deleting properties of the parent Store object. ~Returns a String identifying the Store. Message .= Stores.Item(A_Index).StoreID . "`n"
~Represents a set of Rule objects that are the rules available in the current session. ~Creates a Rule object with the name specified by Name and the type of rule specified by RuleType. - Name(Required): A string identifier for the rule, which will be represented by Rule.Name after rule creation. Names of rules in a collection are not unique. - RuleType(Required): A constant in the OlRuleType enumeration that determines whether the rule is applied on sending or receiving a message. ~Obtains a Rule object specified by Index, which is either a numerical index into the Rules collection or the rule name. - Index(Required): Either a 1-based long value representing an index into the Rules collection, or a string name representing the value of the default property of a rule, Rule.Name. ~Removes from the Rules collection a Rule object specified by Index, which is either a numerical index into the Rules collection or the rule name. - Index(Required): Either a long value representing an index into the Rules collection, or a string name representing the value of the default property of a rule, Rule.Name. ~Saves all rules in the Rules collection. - ShowProgress(Optional): True to display the progress dialog box, False to save rules without showing the progress. ~Returns or sets true or false which indicates whether RSS rules processing has been enabled. ~Applies a rule as an one-off operation. - ShowProgress(Optional): True to display the progress dialog box when the rule is executed, False to run the rule without displaying the dialog box. - Folder(Optional): Represents the folder where the rule will be applied. - IncludeSubfolders(Optional): True to apply the rule to subfolders of the folder indicated by the Folder parameter; False to apply the rule only to that folder but not its subfolders. - RuleExecuteOption(Optional): A OlRuleExecuteOption which represents whether to apply the rule to read, unread, or all messages in the folder or folders specified by the Folder and IncludeSubfolders parameters. ;Folder := "Inbox" ;default "Error"
;IncludeSubfolders := 0 ;default "Error"
;RuleExecuteOption := 0 ;default "Error"
Rule.Execute(ShowProgress) ;, Folder, IncludeSubfolders, RuleExecuteOption) "Error"
~Returns a RuleActions collection object that represents all the available rule actions for the rule. Message .= Rules.Item(A_Index).Class . "`n"
Returns a RuleConditions collection object that represents all the available rule conditions for the rule. Message .= Class := RuleConditions.Item(A_Index).Class . "`n"
~Returns true or false which determines if the rule is to be applied. ~Returns a RuleConditions collection object that represents all the available rule exception conditions for the rule. ~The Exceptions and Conditions properties share the same pool of conditions. Message .= Class := RuleExceptions.Item(A_Index).Class . "`n"
~Returns or sets a Long that indicates the order of execution of the rule among other rules in the Rules collection. Message .= Rules.Item(A_Index).ExecutionOrder . "`n"
~Returns true or false which indicates if the rule executes as a client-side rule. Message .= Rules.Item(A_Index).IsLocalRule . "`n"
~Returns or sets a String representing the name of the rule. ~Returns a constant from the OlRuleType enumeration that indicates if the rule applies to messages that are being sent or received. Message .= Rules.Item(A_Index).RuleType . "`n"
~The RuleActions object contains a set of RuleAction objects or objects derived from RuleAction, representing the actions that are executed on a Rule object. ~Obtains a RuleAction object specified by Index which is a numerical index into the RuleActions collection. Message .= RuleActions.Item(A_Index).ActionType . "`n"
~Returns an AssignToCategoryRuleAction object with AssignToCategoryRuleAction.ActionType being olRuleAssignToCategory. ~Returns a SendRuleAction object with SendRuleAction.ActionType being olRuleActionCcMessage. ~Returns a RuleAction object with a RuleAction.ActionType of olRuleActionClearCategories. ~Returns a MoveOrCopyRuleAction object with MoveOrCopyRuleAction.ActionType being olRuleActionCopyToFolder. ~Returns a RuleAction object with RuleAction.ActionType being olRuleActionDelete. ~Returns a RuleAction object with RuleAction.ActionType being olRuleActionDeletePermanently. ~Returns a RuleAction object with RuleAction.ActionType being olRuleActionDesktopAlert. ~Returns a SendRuleAction object with SendRuleAction.ActionType being olRuleActionForward. ~Returns a SendRuleAction object with SendRuleAction.ActionType being olRuleActionForwardAsAttachment. ~Returns a MarkAsTaskRuleAction object with MarkAsTaskRuleAction.ActionType being olRuleActionMarkAsTask. ~Returns a MoveOrCopyRuleAction object with MoveOrCopyRuleAction.ActionType being olRuleActionMoveToFolder. ~Returns a NewItemAlertRuleAction object with ActionType being olRuleActionNewItemAlert. ~Returns a RuleAction object with RuleAction.ActionType being olRuleActionNotifyDelivery. ~Returns a RuleAction object with RuleAction.ActionType being olRuleActionNotifyRead. ~Returns a PlaySoundRuleAction object with PlaySoundRuleAction.ActionType being olRuleActionNotifyRead. ~Returns a SendRuleAction object with SendRuleAction.ActionType being olRuleActionRedirect. ~Returns a RuleAction object with RuleAction.ActionType being olRuleActionStop. explain or give an example of what things like activeExplorer are activeInspector etc. your tuts are touted as noob friendly its easy to forget that as we learn these things such terms become common place to us but is what confused us in the beginning. Thanks! Praise from you is rare at best. Example of adding an outlook task? This seems like a good spot for this. I have been fighting an issue with one of my apps for a long time regarding the "Allow external apps" popup and (with the help of a friend) was able to finally get around the issue locally via a registry mod. I've wrapped the calls in a little GUI to distribute to end users as an optional fix, but the calls are simple enough to work into some logic. 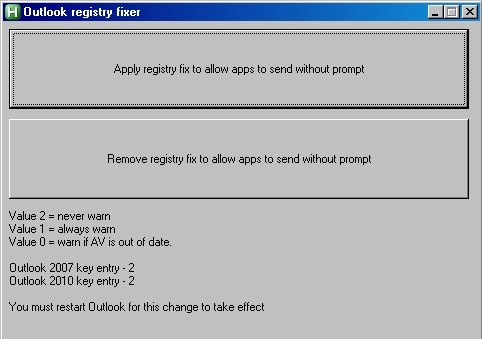 This has been tested with outlook 2007, but is designed to fix the issue with 2010 as well (14.0). This only needs to be run once to set the reg keys. NOTE: This can bypass exchange server settings for object model guard. Nice. I fell there are too few people that work with Outlook COM which makes me sad as it's one of the more complex of the Microsoft programs (IMO). Most of your code above only display messages.